The finest city coat of arms ever to be designed. 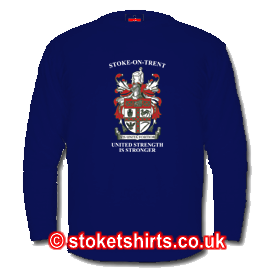 The motto - "Vis unita fortior" and it's Translation - "United Strength is Stronger" are both included on the shirt. 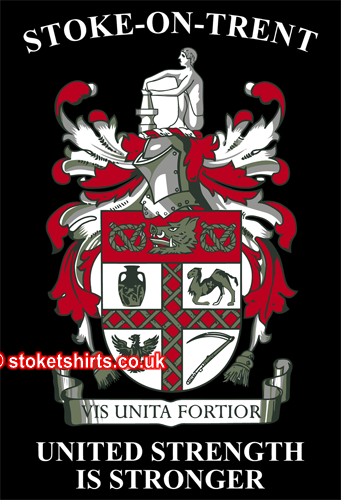 A representation of the six towns all bought together in 1925 to form The City of Stoke - on - Trent, although this crest was recognised on the 20th. March 1912 where the six towns united into a single County Borough. 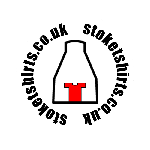 The Staffordshire Knot in the top panel is taken from the Tunstall Arms. The Boar's head, in the top panel, was taken from the Stoke-upon-Trent (Stoke Town) Arms (The Arms of the Copeland Family). The Portland Vase (top left quadrant) was taken from the Burslem Arms. The Fretty Cross appears on the Arms of the town of Fenton. The Hanley Arms provided the Dromedary Camel (top right quadrant) (Crest of the Ridgway Family). The Eagle (bottom left quadrant) was taken from the Longton Arms (Crest of James Glover). The Sythe (bottom right quadrant) is taken from both the Tunstall and Burslem Arms. The Egyptian Potter at his wheel represents the pottery industry.